This is a really great example of autoethnography and I really enjoyed reading your post! Your reflection on your use of KPop and Asian culture as a sort of refuge from the crudeness and unashamed sexual nature of American culture is an aspect of your experience that resonates strongly with my own experience. Another aspect of KPop that I have noticed feels like escapism from the sometimes monotonous Australian, American and British music scenes is the amount of thoughtful, supercharged creativity inherent in the production of KPop music videos, such as the quirkiness and cultural references present in Red Velvet’s ‘Happiness’ (https://www.youtube.com/watch?v=JFgv8bKfxEs) and artistic, post-modern style of Orange Caramel’s ‘My Copycat’ (https://www.youtube.com/results?search_query=orange+caramel+my+copycat). I also love this obvious cultural appropriation in the Taemin ‘Danger’ video; Taemin is completely and utterly the new Michael Jackson in my opinion (https://www.youtube.com/watch?v=UF8m2JIDjKU). It would be really interesting to look at how KPop appropriates, repurposes and reimagines culture and art, and examine how your personal response to a new (to you) KPop video is shaped by the cultural context that you have grown into (Australian multiculturalism, integration of American culture since the beginning of the 1900s and the television/pop art era etc). Though Gemma’s already said it, that was a great discussion. For this week, I looked at J-Pop and I can see some comparisons with your discussion and perhaps some explanation as to the western references. I read an article by a Japanese professor who, though obvious in retrospect helped me in realising J-Pop as a reaction that reflects an anxiety of western dilution of cultural content in Japan. As has been noted this idea is perpetuated in Japan’s distaste in accommodating an international market. 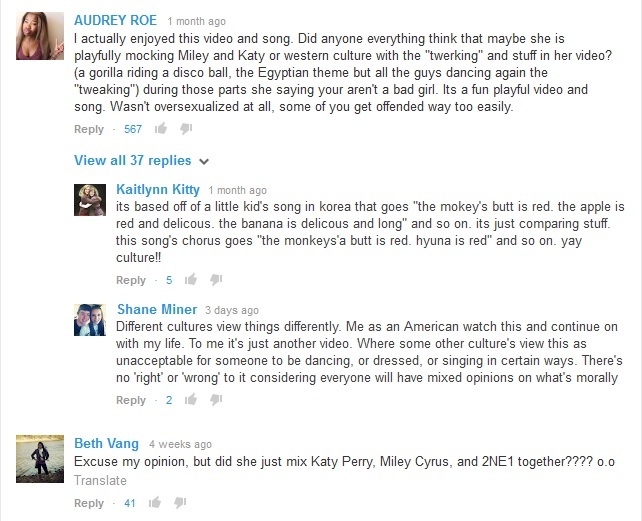 Is it in drawing comparisons that this example of K-Pop “recycling” of western content is given some validity? Korea clearly has a great interest in the promotion of their culture, so is this simply an attempt to continue the conversation? It might be just me but I also noted some elements of Gangnam Style in the video as well, which might serve as a further promotion technique. These conclusions are pretty thin but I thought it might be an interesting point for reflection. I think the language barrier and presumption about what we expect from Korean pop music have a huge impact on how people outside Korea (especially Australian and perhaps other Western countries) receive and respond to K-Pop. I agree with you and think the comments that people made about this video imitating aspects of American music videos is a massive oversimplification of a global cultural phenomenon that is in no way new or unique to music industries. Think of how fashion designers t borrow elements or motifs from other cultures, rework them, and make something completely new or different. For example, the use of tribal prints in an Italian designers line of dresses might echo a traditional African dress. I think that HyunA’s video culturally appropriates motifs from American music videos in a way that appeals to both Korean and Western audiences.